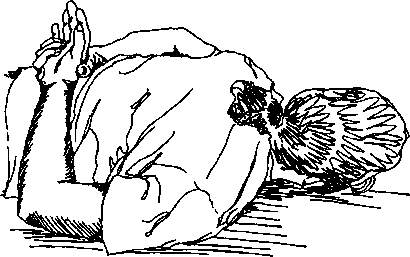 Aikido rarely blocks, never stops, does not jerk or pause, but continues and transforms motion. This continuity seems difficult to learn, but nearly everyone used it regularly — to survive gym class or boot camp. Do 10-20 pushups. Note the amount of effort required. Rest. Lie face down on mat, palms up on back. Place hands on mat; do one pushup. This procedure eliminates motion, inertia, and all possibility of following and flowing with the upward or downard motion. Note the number of pushups done, and the effort required to do them. 3. Observe the difference between following the flow of energy and inertia in a technique and trying to force a technique under your own power. Health" (Appendix B), movements are performed two or more times on a side. 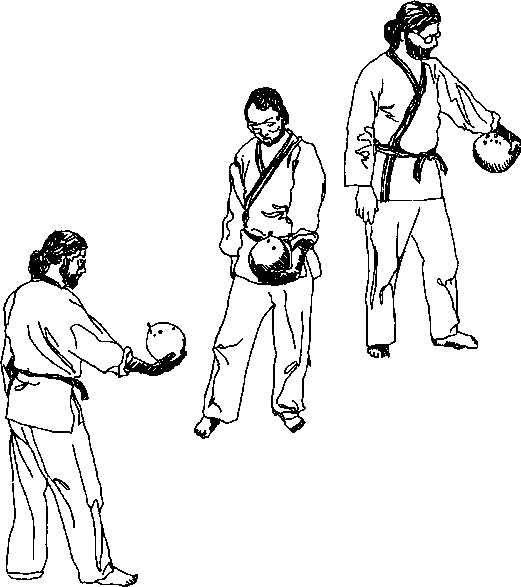 Nage do an exercise such as Arm-Swinging twice on a side; uke test. Repeat the sequence, but this time for Step 2 ("once on each side"). First imagine doing the movement, then follow with physical motion. Uke test. Notice the sensations of your body during the exercise. Practice recreating the sensations and imaging the motion in your mind. In this way, the mind forms a "template" for the upcoming physical action.